Our senior engineers are highly experienced and skilled in all areas of tailings, waste, water management and geotechnical engineering. If you want to discuss a new or upcoming project, we are only too happy to have a chat. Tell us about your project and our technical team will get back to you within 1 working day. 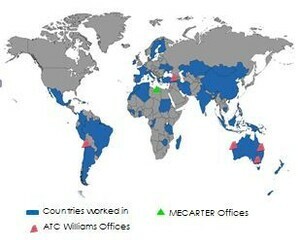 ATC Williams is pleased to announce we are now working in partnership with Mecater, based in North Africa, enabling us to provide quicker, more direct support to our clients at the source.